Research Fellow at University of Limerick talks about his work with Glantreo’s porous materials for Gas Sorption and Separation. The development of the next generation of porous materials is key to enabling the “age of gas”, wherein new technologies develop around the storage and separation of gases. Industrially, removal of CO2 is important in multiple chemical purifications including flue gas (0.15 bar CO2) and natural gas (NG) processing (0.5 bar CO2). Industrial specifications require CO2 concentrations in natural gas (NG) of below 50 ppm before liquefaction because of corrosion and CO2 freezing at -161 °C. The diversity of CO2 concentrations and gas mixtures creates a challenge in addressing trace CO2 capture via a single solution. Current commercial CO2 capture systems, using primary and secondary alkyl amine scrubbers, can capture a few hundred tonnes of CO2 per day. However, they are the most expensive aspect of an overall capture, transport and sequestration system and are limited by high regeneration energy, large equipment size, amine degradation and equipment corrosion. CO2 capture using solid adsorbents has long been recognised as an energy efficient alternative to traditional processes; however, no suitable candidates have yet been reported in terms of selectivity and performance in the presence of moisture. Figure 1: Schematic of amine modification of mesoporous silica and subsequent adsorption mechanism between CO2 and functional amino groups. In this context, amine modified silica’s (Figure 1) such as MCM-41 and SBA-15 have been deployed for use in CO2 capture applications. – APTES and TEPA modified silica species exhibit exceptional CO2 separation performance under both dry and humid conditions. The combination of exception affinity towards CO2 in conjunction with fast CO2 uptake kinetics (Figure 2A) gives way to highly efficient and selective CO2 separation performance in mixed gas streams (Figure 2B) with CO2 effluent concentrations reduced to ca. 20 ppm during breakthrough studies. Sorbent regeneration could be achieved at temperatures as low as 75 °C. The amine modified sorbents were found to have CO2 uptake capacities of ca. 2 mmol/g and were found to be stable for up to 15 adsorption/desorption experiments. What problem did the Glantreo product solve? Glantreo provided me with several porous silica species which have been modified for use in CO2 adsorption processes. The highly tailored nature of the porous silica enables investigation of structure property relationships in the amine modified adsorbents. 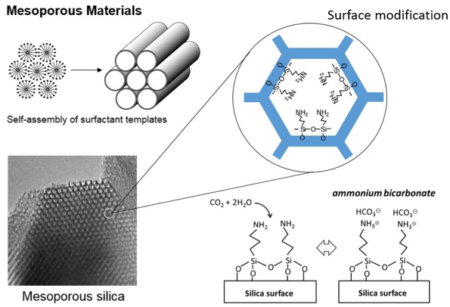 Figure 2: (A) Gravimetric CO2 uptake by APTES and TEPA modified mesoporous silica materials; (B) Dynamic gas breakthrough performance by APTES-PSU mesoporous silica (15 CO2/85% N2 gas mixture). What was the outcome-Did we solve the problem? The availability of MCM-41, SBA-15, Al-MCM-41, Solas and Solad particles enabled screening of amine modified silica’s for gas sorption performance. The variations enabled comparisons based on particle surface area, pore size, pore geometry’s etc . Pelletisation and pilot scale testing of amine modified and pelletised materials for CO2 capture on Kg scale (TRL 5-6). Are there other issues Glantreo could help with? Some additional areas of interest include immobilisation of pharmaceutical species for drug delivery applications and NH4+, F-, NO3+ removal from dairy waste. Kitagawa, S., Angew. Chem. Int. Ed., 2015, 54, 10686-10687. Lee, I. & Moon, I. Ind. Eng. Chem. Res. 2017, 56, 2804-2814. Boot-Handford, M. et al., Energ. Environ. Sci., 2014, 7, 130-189. D’Alessandro, D. M., Smit, B., Long, J. R., Angew. Chem. Int. Ed., 2010, 49, 6058-6082. Kumar, A., Madden, D. G., Lusi, M., Chen, K. J., Daniels, E. A., Curtin, T., Perry, J. J., Zaworotko, M. J., Angew. Chem. Int. Ed., 2015, 54, 14372-14377. Choi, S., Drese, J., Jones, C., ChemSusChem, 2009, 2, 796-854. Madden, D., Curtin, T., Hanrahan, J.P., Tobin, J., AIChE, 2016, 62, 2825–2832.